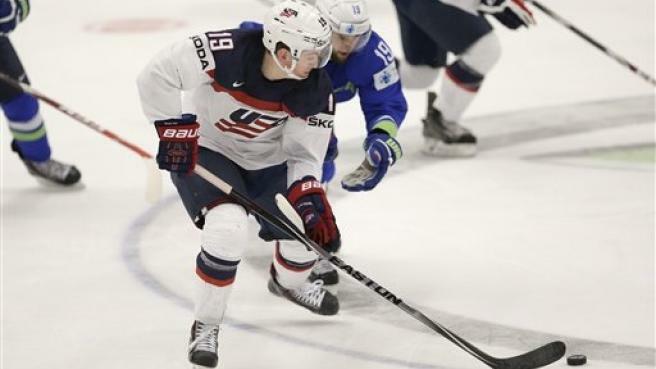 On Friday afternoon the New York Rangers announced via Twitter that they have signed free agent winger Jimmy Vesey. The 23 year old Harvard graduate joins a surprisingly young Rangers roster that (as of today) only features five players over the age of 30. It’s not hard to see why Vesey decided to play in New York- he joins Hockey East alums Chris Kreider and Kevin Hayes in Manhattan, not to mention Derek Stepan and Mats Zuccarello. New York’s young roster also gives Vesey a clear chance to work his way to a first line role pretty quickly and position himself to become a star in New York down the road. Despite the arguments that the Rangers’ Stanley Cup “window” has closed, New York fans should be excited to see how Jimmy Vesey the player matches up against Jimmy Vesey the hype train. The Bruins were one of the favorites to land Vesey’s services since he originally announced he would decline to sign with Nashville, the team that drafted him, in the spring. Supposedly Boston was in it until the end, bringing Patrice Bergeron and Brad Marchand amongst other members of the team’s leadership group to pitch the Bruins to Vesey this past Tuesday. Boston’s failure to sign Vesey isn’t so bad, really. Despite the hype, Vesey is still an unproven commodity at the NHL level. There is no reason to assume he won’t be a capable NHL player, but assertions that he will score 25 goals and 50+ points this season are no more than guesswork until Vesey actually steps on the ice in October. Vesey’s main position is left wing, a position the Bruins have three capable forwards in at the moment- Brad Marchand, Matt Beleskey, and Frank Vatrano. If Vesey signed with the Bruins, one of Beleskey or Vatrano would be bumped down a notch on the lineup or asked to spend time playing their off wing to make room for Vesey. His presence would have been a tremendous boost to what looks like an already deep forward group this year in Boston, but luckily there is no gaping hole on the left side that fans were hoping Vesey could fill. There’s still the matter of depth at the right wing position- David Backes can certainly play on the top two lines, but David Pastrnak will have to have a true breakout season to effectively replace Loui Eriksson, who was among team leaders with 63 points last season. Luckily, there are plenty of prospects who will be battling it out for the final few forward spots on the roster come training camp next month. Between Austin Czarnik, Danton Heinen, and Seth Griffith, it’s likely Claude Julien and his staff will find a player ready to contribute at the NHL level. Vesey’s signing means the Bruins roster come training camp is what they have right now. It also means the offseason is all but over- soon we’ll be able to talk about players on the ice as opposed to where players will take the ice this season. As August ends and September begins, we can start previewing the NHL season and looking forward to training camp and the NHL’s World Cup of Hockey.